The night before his wedding, Jared Dupre discovers the demonic witch, Adam Montief, has kidnapped his brother, threatening to kill him, along with Jared’s fiancée, Kendra O'Connell, for a centuries-old vendetta Jared knows nothing about. A powerful witch himself, Jared tracks Adam from New Orleans to a remote island off the coast of Connecticut. A swordfight ensues where a final thrust of Jared's blade sends Adam over the cliff into the sea below. When Jared returns to New Orleans, he finds a triumphant Adam alive and declaring his love for Kendra. Kendra, not knowing Jared was forced to break off their engagement to save her life, turns to a new man, unaware he’s the same man who vows to kill the man she loves. Jared must look to the past to discover the truth behind the Montief’s vengeance against the Dupres while he fights to win back Kendra and bring about Adam's final destruction before Kendra is seduced into Adam's world of revenge and sadistic evil. When the glass remained blank, fear clutched at her chest. Again, she said the words, and the image of a plantation house engulfed in flames appeared. “No, please, he can’t be dead.” Tears blurred her vision. The fiery image changed to reveal a human form lying beneath flowering bougainvillea. Hope rising, Angelique peered closer. He couldn’t hear her, but she hoped in his heart that he knew she would find a way to get to him. As the smoke in the room thickened, she knew her time was running out. She rewrapped the mirror and placed it into the smaller casket among cloth bags of herbs and potion-filled vials. Relocking the lid, she hung the key on a chain around her neck, dropped a jeweled dagger into her pocket, and tucked the casket under her arm. Crouched beneath the smoke, she considered the quickest way to reach her son and escape. Augustus had locked her in, placing what he thought would be an impenetrable shield across both doors. Angelique coughed, choked by the smoke. Her husband’s biggest mistake was underestimating her power. 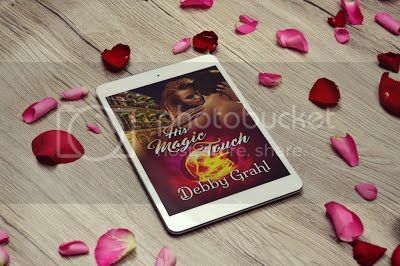 Debby Grahl lives on Hilton Head Island, South Carolina, with her husband, David. Besides writing, she enjoys biking, walking on the beach and a glass of wine at sunset. Her favorite places to visit are New Orleans, New York City, Captiva Island in Florida, the Cotswolds of England, and her home state of Michigan. She is a history buff who also enjoys reading murder mysteries, time travel, and, of course, romance. Visually impaired since childhood by Retinitis Pigmentosa (RP), she uses screen-reading software to research and write her books. Decorated to Death is a holiday mystery cozy. She also has stories in three anthologies, The Haunted West, Never Fear/Christmas Terrors; and Ebb and Flow from the local Island Writers’ Network. Debby was featured in the January, 2016, Hilton Head Monthly article ‘Intriguing People of the Lowcountry’. She is a member of Romance Writers of America, Florida Romance Writers, and First Coast Romance Writers. 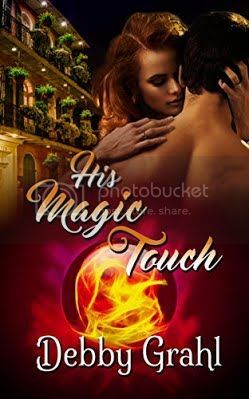 Her latest book, His Magic Touch, will be released December 5, 2018, by Wild Rose Press.